Weird Season is the debut EP from Brisbane four-piece Major Leagues, a shoegaze/dream-pop band relatively new on the music scene. This EP doesn’t sound like a debut release though, instead sounding like an offering from a seasoned band. Opening with the fuzzy guitar and sweet vocals of ‘Silver Tides’, you’re immediately drawn into the nostalgic feeling of the record. The bittersweet chorus echoes ‘you look like someone else I know’, and is instantly catchy. ‘Endless Drain’ inspires dancing through the driving snare hits and snaking guitar melody. It’s the subtle changes that make this song so amazing, like the added hi-hats just before the chorus, which build a quick tension that is released in the chorus . It’s the kind of ironic summer anthem that we’re familiar with thanks to early 90s acts such as the Breeders. Out of the whole EP, the melancholy ‘Feel’ and ‘Teen Mums’ have the stronger shoegaze influences. Breathy vocals and textured guitars show a softer side to the band. Closing track ‘Creeper’ ends the EP on a high note. It’s arguably the catchiest, most lively song on the album, and leaves you wanting to hit repeat before the song is even done. With hints of punk and slightly harsher vocals, the whole song is beautifully nostalgic. Perhaps some of the charm of Weird Season comes from it being so relatable. I’m a sucker for twenty-something year old women who love music and are equally as apathetic as I am. ‘Hanging around my parents house/I’m bored as hell’ from ‘Creeper’ resonates strongly and is reminiscent of summers spend lazing around waiting for something to happen. Weird Season is perfectly paced, and packs enough to keep you coming back for more. Each song is memorable in its own right, without relying on cheap and quick guitar hooks or chanty choruses. Major Leagues have put together five original, diverse, and well-crafted pop songs and I certainly can’t wait to hear more from them. 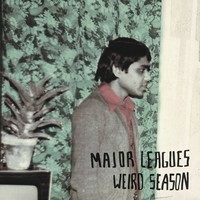 This entry was posted in Music and tagged EP, lip, lipmag, Major Leagues, music, Review, Weird Season. Bookmark the permalink.